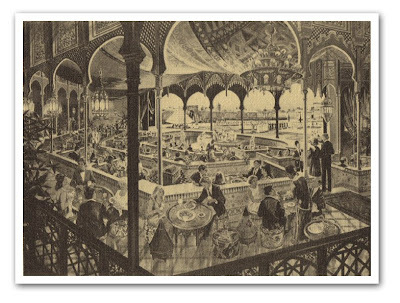 Rather than the Restaurant Marrakesh that we know today, the Morocco pavilion was to have a dinner show called Magic of Morocco. The pavilion would welcome guests with exotic plants in the Hesperides Gardens and jagged rock formations in the Hercules Grotto. Past the Medina would be the Southern Morocco sector. "Here, lunch can be enjoyed in a desert kasbah where scenes of the Moroccan landscape pass before the diners. Later in the evening the kasbah features the 'Magic of Morocco' dinner show. This presentation combines live action with a panoramic background. A storyteller appears on the stage and begins to relate tales of Morocco. Scenes from his stories appear behind him, and he turns and seems to step into the film itself. He guides the guests through the setting and comes upon a troupe of dancers and acroboats. They, in turn, step out of the film and onto the stage to complete their performace." Sometimes I think it is a little depressing to hear about what could have happened! That would have been nice; but never having been in Restaurant Marrakesh, I don't have a basis for comparison. But, that will all be corrected on September 27th. I was watching a special the other day and it was talking about how the King of Morocco sent his own architects to ensure authenticity and how his personal executive chef now works in the resturant. AMAZING! Thats how disney does it RIGHT!